On Art's Place in the Scope of Unique Human Activities. There is often debate among both artists and critics about what constitutes art. To some, art comes from the play instinct. To others, art is about communication. To others, art is about self-expression and is deeply private. Others see art as public and believe it is about improving (by either provoking or beautifying) the community. Proponents of each definition of art sometimes are at each others' throats. 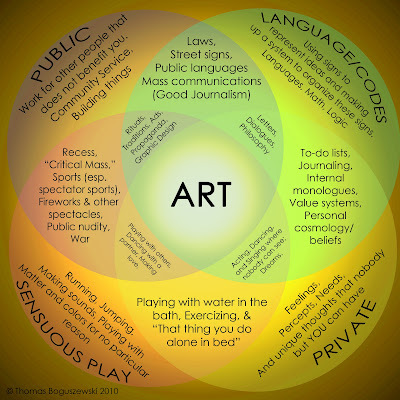 Each could cite perfect examples of things that are purely communication, purely play, purely private or purely public works —or some combination of two or three of these attributes— that are not *quite* art. Frequently, Theorists use these examples of "not-art" to attack their opponents positions. 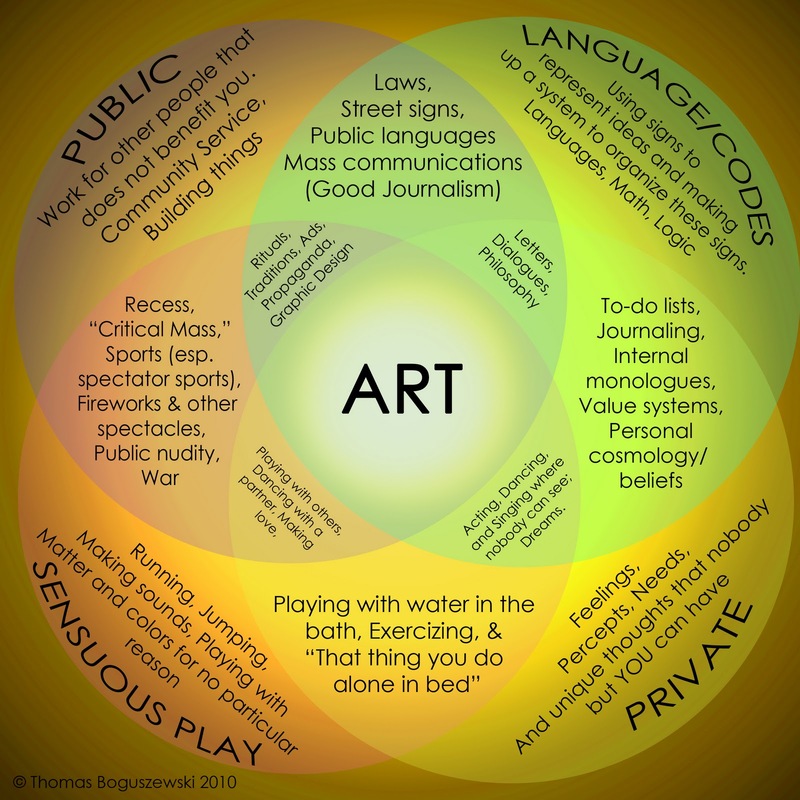 Art isn't synonymous with Communication, Play, Public Work, or Self-Expression. But it IS these things! The truth of it is that art is ALL FOUR of these things at ONCE. Art is a balancing act, and if you were to remove even one of the above attributes from an art form, it would cease to be art and begin to be something else. The Universe is a balancing engine. Human potential, as a product of the universe, is also self-balancing. It makes sense that art, as a product of human potential, should ideally be as broad, balanced and flexible in it abilities as those powers which produced it. This diagram is by no means a perfect one! But I know there's something TO it. And the discussions that this will start have infinite worth. *I called this a Venn Diagram, but since it only has 13 intersections, it is not technically a Venn Diagram, but some kind of special symmetrical 4-circle diagram without a name. Not everything on this diagram is art by my definition, but it is all what I like to call "Unique Human Activity." My idea of Unique Human Activity is closely related to the definition of Art put forth by Scott McCloud in his brilliant book Understanding Comics. I think that while some things that would exist in McCloud's art-sphere don't constitute art in my opinion (such as sports and philosophy), everything that DOES stem from something other than reproduction or survival is still uniquely human, and is therefore AWESOME and worthy of praise. In his book, "The Birth of Tragedy" Friedrich Nietzsche wrote that all true drama comes from the juxtaposition and precarious balance between Apollinian (linguistic, intellectual, order-seeking) and Dionysian (playful, sensuous, chaotic) forces. He argued that when drama began to favor one force over the other, the art form began to decline.